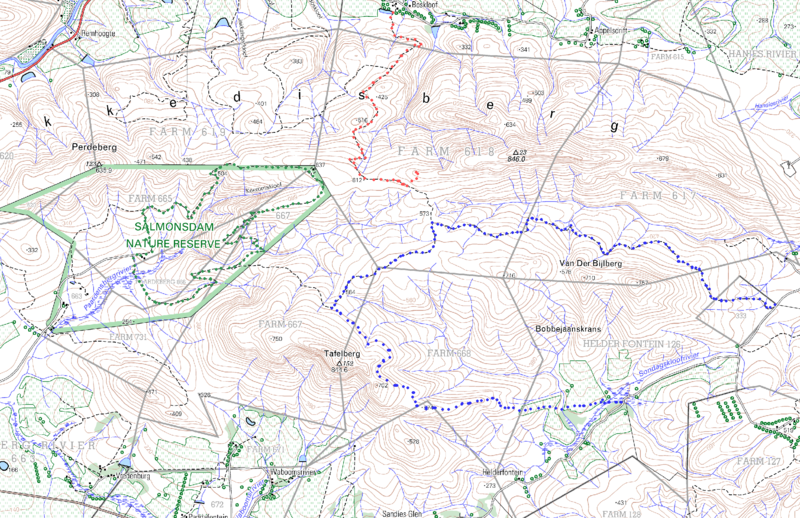 Having just undertaken a very good walk in the Salmonsdam region with Debby and Keith, I thought I would see how it fits together with the other walks we have done in the area. 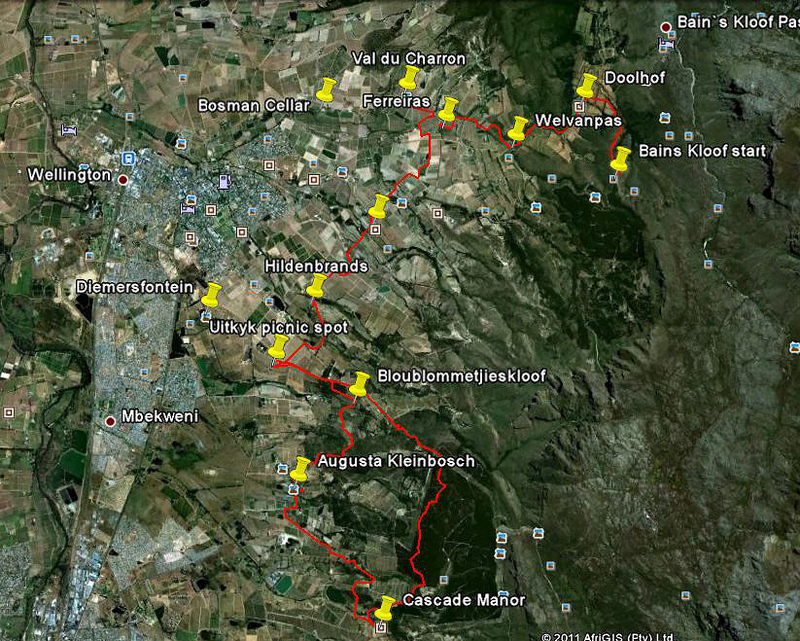 The attached map shows the Salmonsdam Reserve walk in green, the Boskloof walk in red and the latest one in blue. As you can see they are all pretty close together and one could go from one to another along the existing tracks. 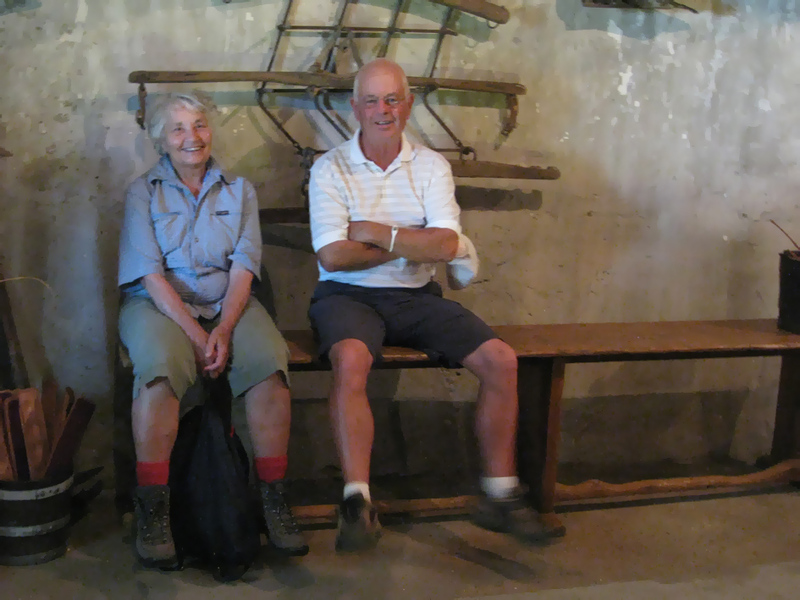 Debby and Keith led us on a wonderful new walk a short distance to the east of their farm. 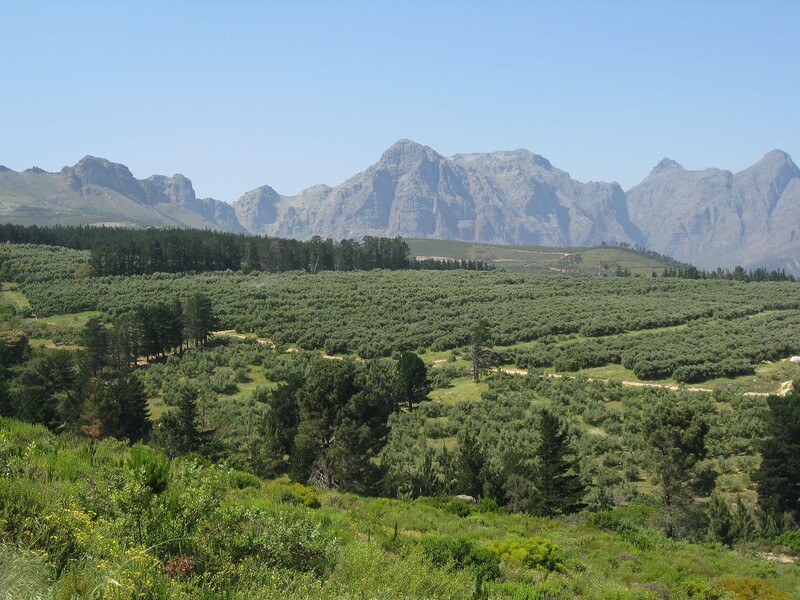 We started by going up a track on the north slopes of Van Der Bijlberg, then across a neck to the north slopes of Tafelberg, down the eastern Tafelberg ridge and back to the road on the farm Helderfontein. The total distance covered was 15.3 km and we climbed from our start at 341 m to a height of 612 m, before returning to 311 m., with many undulations along the way. There was a threat of rain in the air and we had a cold north-wester blowing, but it didn’t rain and we stayed nice and cool – a perfect day to take a hike!! 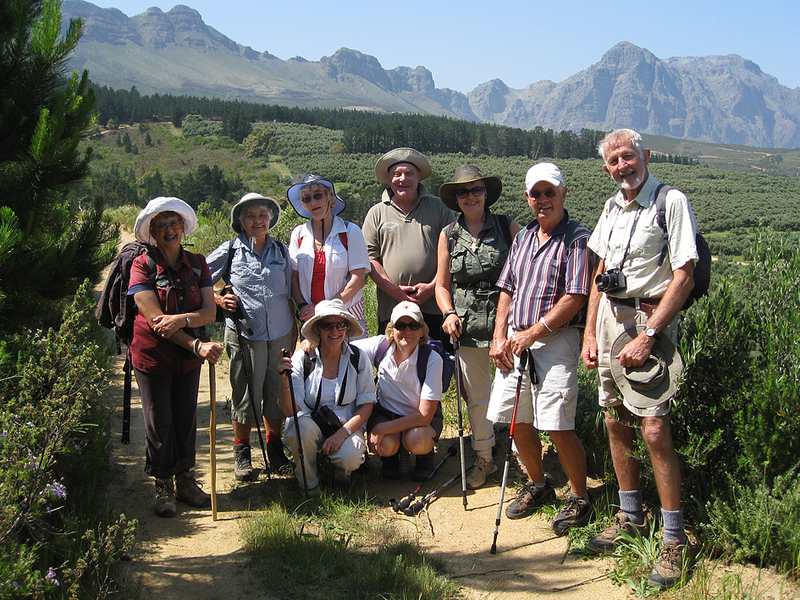 There were only eleven of us and we felt sorry for those who could not make it as it was one of the best walks we’ve had for a while, probably because it was completely new and the fynbos was at its magnificent best. Unfortunately there was one stretch near the start where a fair amount of pine and hakea was present, but once we were through that it was splendid all the way. Especially abundant were the brunias, mimetes and a great variety of restios, as well as very many different everlastings. As usual, there were many unidentified species. We ended off by having drinks and a snack at Debby and Keith’s recently and beautifully renovated cottage on their farm, before returning home, exhausted, but ready for more such challenges. We did decide to postpone our Christmas function this year and will be having a New Year’s party in mid-January instead. This will give more people a chance to attend, once the Xmas festivities are over. A notice will go out to all members detailing the new arrangements. Can you believe it? Today at lunch time a new swarm decided that it too, liked our garden and it has swarmed at exactly the same place as the first one did a week ago. It is a much smaller swarm this time round. Lawton advised that they are probably just resting and that they are unlikely to stay there, so I’ll be patient and see what transpires. Perhaps they think this is a good watering hole along the way. We’ll just have to wait and see. 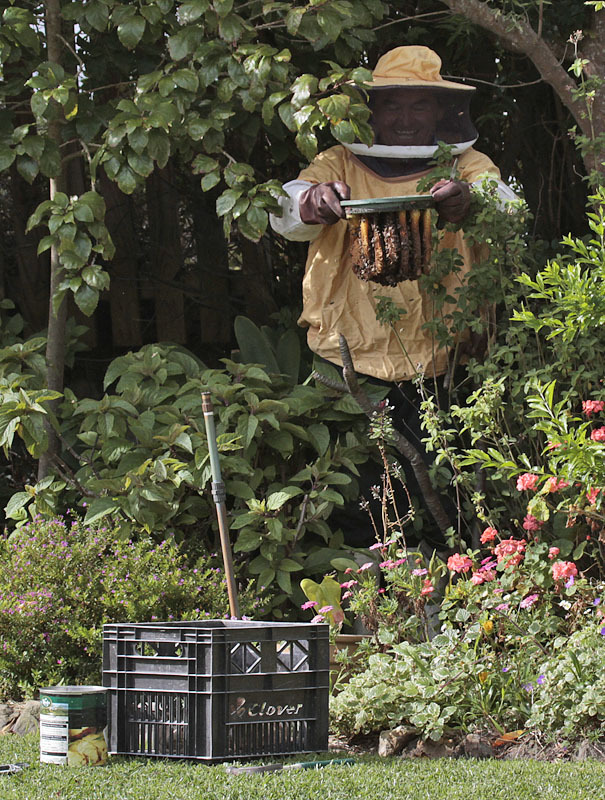 Well, today I got a local beekeeper, Lawton Roberts, to come and remove the hive from my valve box. This, you will remember, was found two days ago when I tried to get my sprinkler system fixed. 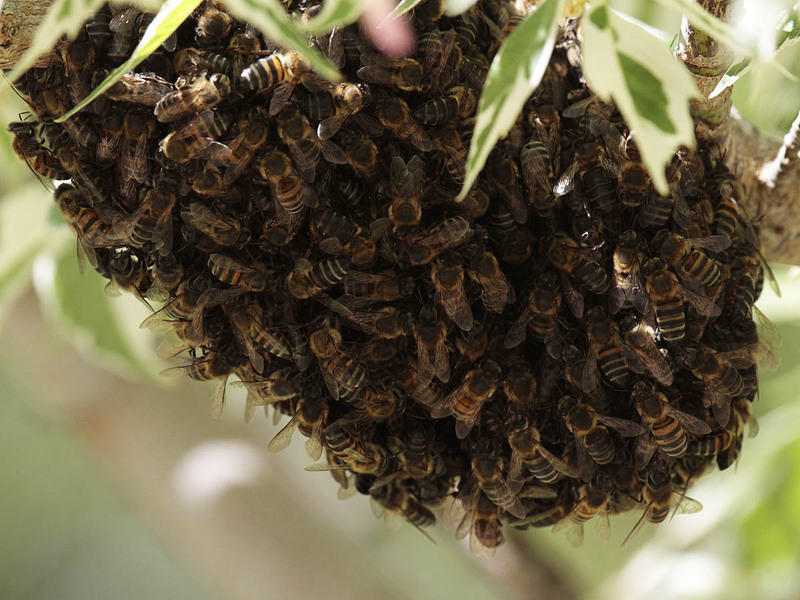 He found a well-developed colony inside it, complete with combs and honey and he moved it all into a small wooden hive that he had brought along. This he has left in the garden and tonight, when the bees have all gone home, he will remove and that should be the end of that. Now, hopefully, we’ll be able to proceed with the irrigation repairs! 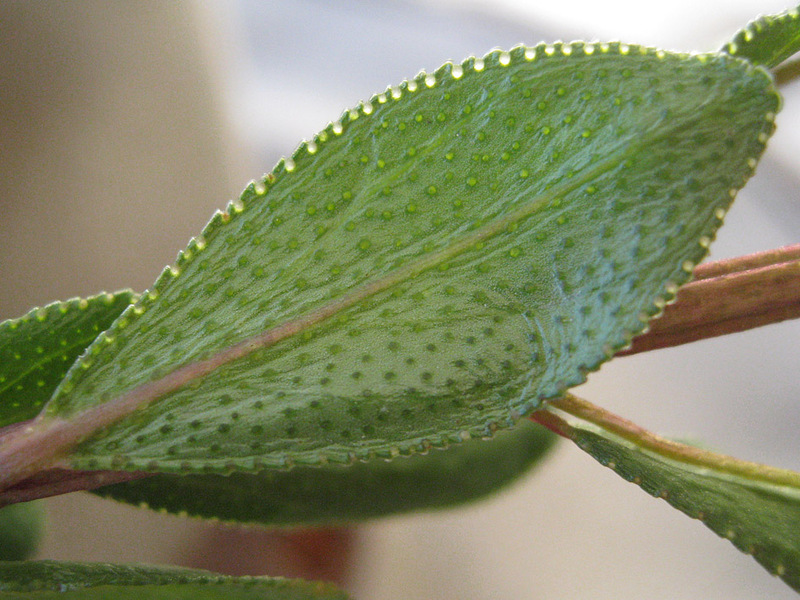 Muraltia heisteria sounds just like any other plant to the non-botanist, but give it the name by which it is known in Wellington, South Africa, and it takes on a whole new personality! 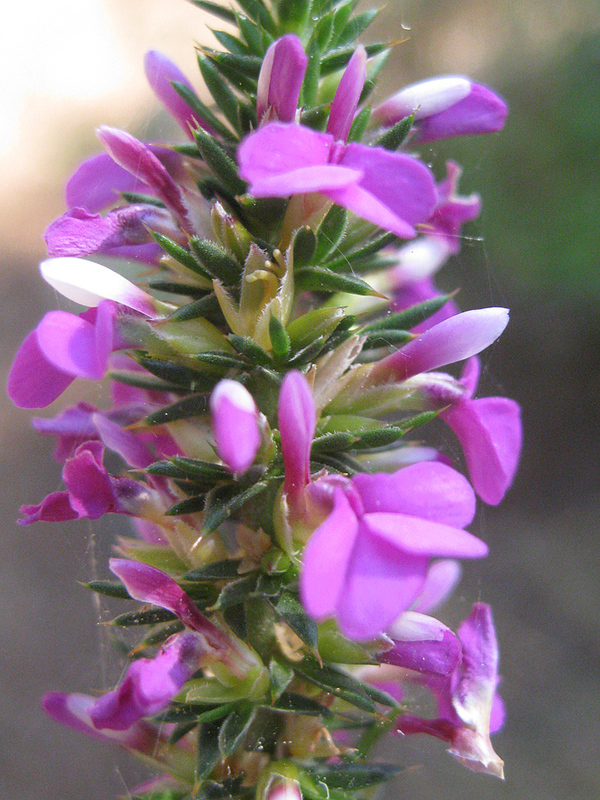 Believe it or not this plant is called “Voel-kan-nie-sit-nie”. Isn’t that a wonderful name? Thought I would share it with you. Its the sort of thing one never forgets. 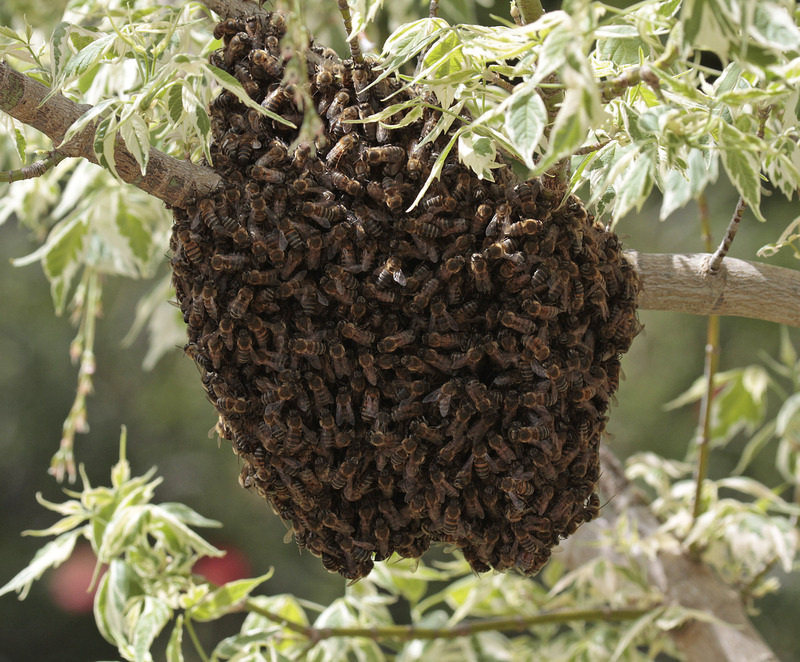 Imagine my surprise, when looking round the garden last evening, to find a small swarm of bees hanging from a tree on the edge of our patio. Nice to know that nature is alive and well and doing the pollination thing, but did we really want them there? I think not. The question was, how to get rid of them, i.e. make them go elsewhere? I tried some smoke, but the wind wasn’t helping. I tried spraying them with the hose, but they just ignored it. In the end I threw a stick at them, hoping to persuade them to leave in favour of a quieter life, but all they did was fall to the ground and proceed to swarm around the leg of my Weber braai! In the end I decided to leave them for the night and hope they would depart under cover of darkness. Imagine my frustration this morning when I looked out and there they were, still clutching the Weber. Renée suggested a more forceful water spray, so I threw caution to the wind and went after them with the hose. They were spread apart by the water, but refused to relinquish their spot. You’ve got to give it to them, they don’t give up easily, but neither will I. At least they seem fairly benign, but woe betide me if I provoke them too much. As I write this they are still here, but less organised. Looks like its 1-1 going into half time! We knew that it was going to be hot, but leaving Hermanus on Sunday afternoon in a pleasant 20°C did not prepare us for the scorching 37° that we encountered at Diemersfontein, our destination and the start of our Wellington wine experience. Fortunately we only had to meet our hosts and then proceed to our first wine tasting in the Diemersfontein tasting room, so it was bearable. 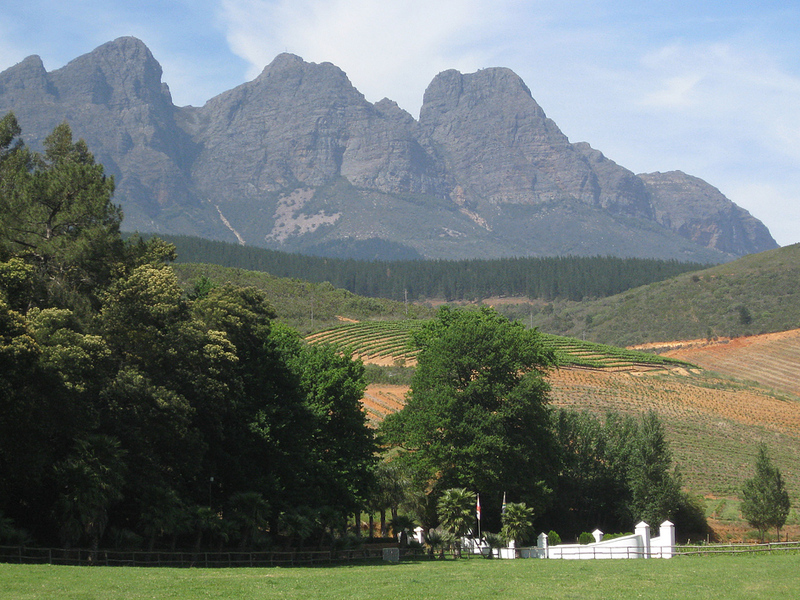 The estate continues to produce big wines, dominated by the well-known, coffee-flavoured Pinotage. Our party comprised David Brice, Angela Heslop, Ian and Christine Ross, Mike and Koekoe Ravenscroft and Renée and me. 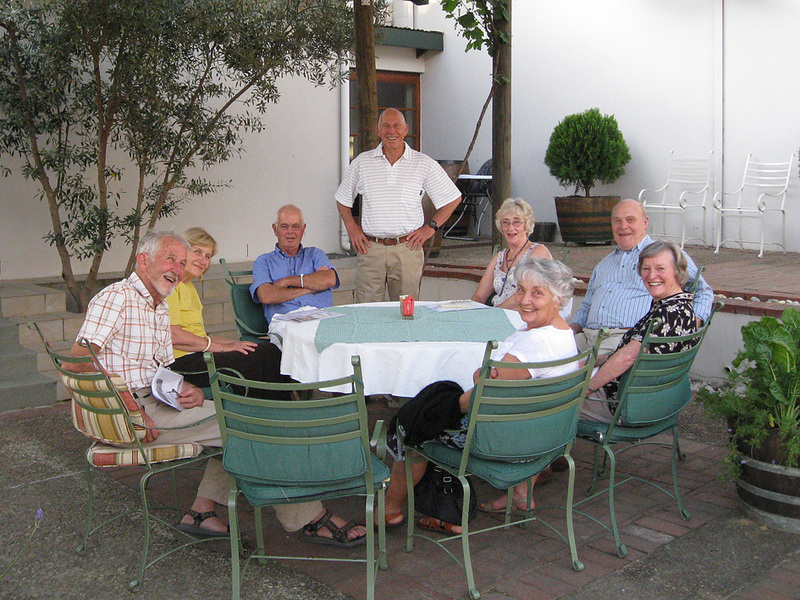 We had all been to Diemersfontein in May 2004 as members of the Hermanus Wine Club and we found the estate much changed, but regrettably, not necessarily more hospitable. On Monday morning we were met by our guides, Jeanette and Katrin who soon earned the respect of all with their intimate knowledge of the local people, their activities and their history. 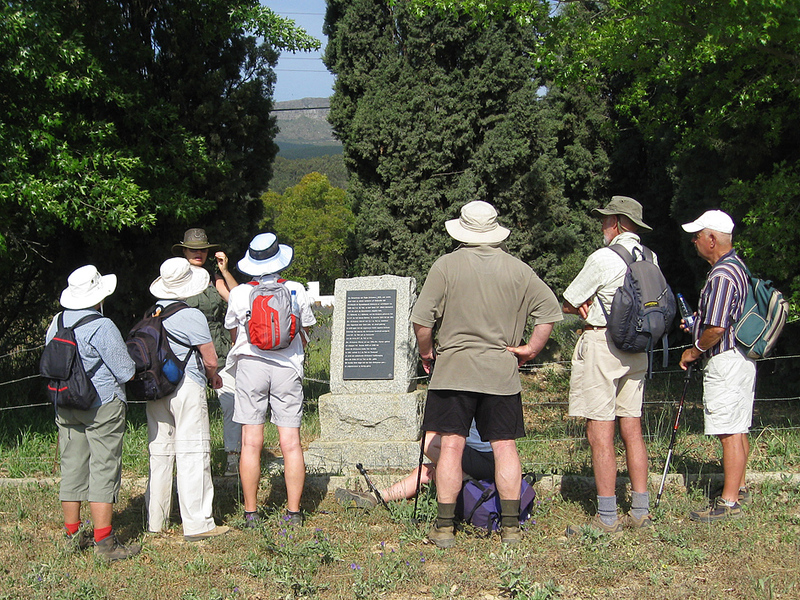 This walk was far more than a wine walk, as advertised – it would be better called a Cultural Experience. 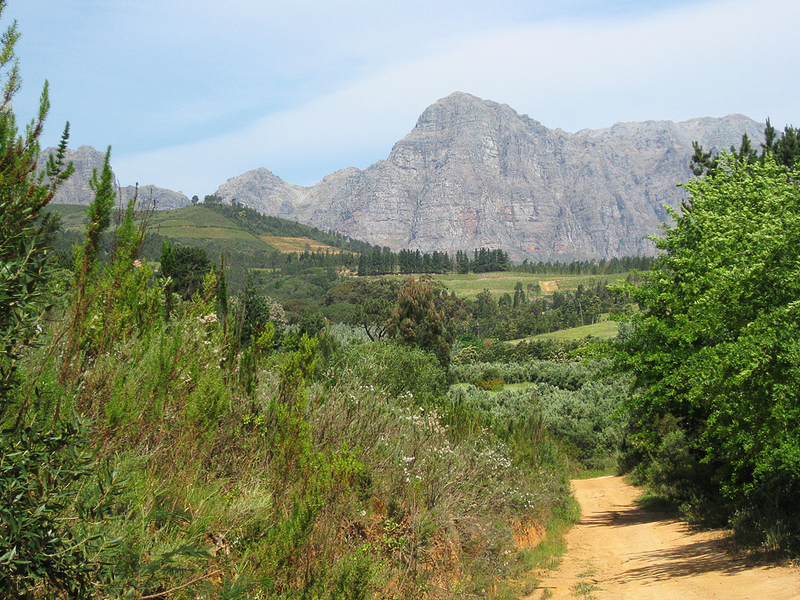 Our route on the first day took us up through pine forests and over the foothills of the the Du Toits Kloof. I think that we were all somewhat surprised by the extent of the local olive production, especially the Costa table olive orchards, with more than 5000 trees. Cascade Manor was our destination for lunch. Originally built by the Duke of Bedford, it was recently refurbished and extended by its present owner, Volker Goetze, who now runs it with his wife, Maika, as a guesthouse and wedding venue. 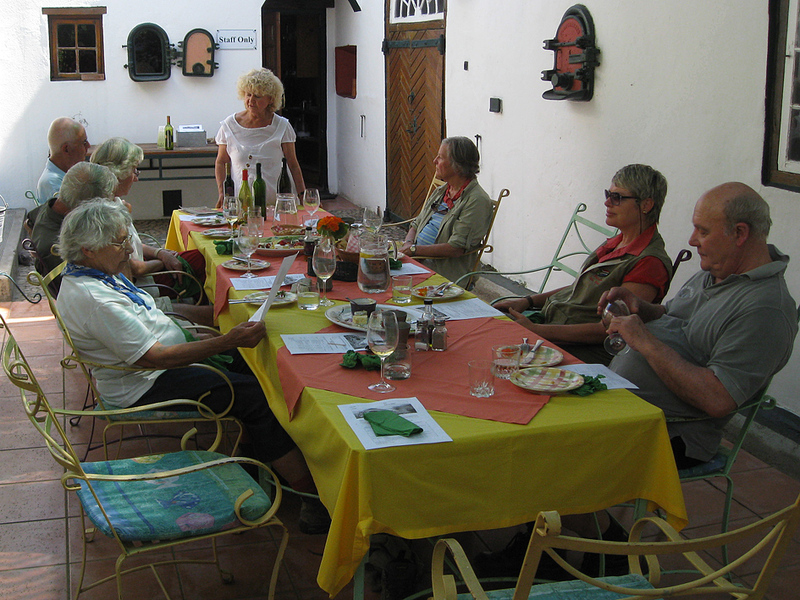 Volker gave us a detailed talk on olive oil and introduced us to the art of olive oil tasting. We all left with a new interest in the subject and an understanding of what to look for in a good oil, but not before we had enjoyed delicious lunch, with plenty of olives to whet our tastebuds. Our next stop was at Druk-My-Niet, a small wine estate, where the wine maker, Abraham de Klerk showed us his range of excellent wines. His soon-to-be-released T³, a blend of Tannat, Tinta Amarello and Tempranillo was the high point of the tasting, although we were all impressed by the Fine Art Collection (and the art which inspired the labels). From there it was a short distance down the hill to the Augusta Kleinbosch Guest Farm, where we were greeted by our hosts, Laetitia and Francois. 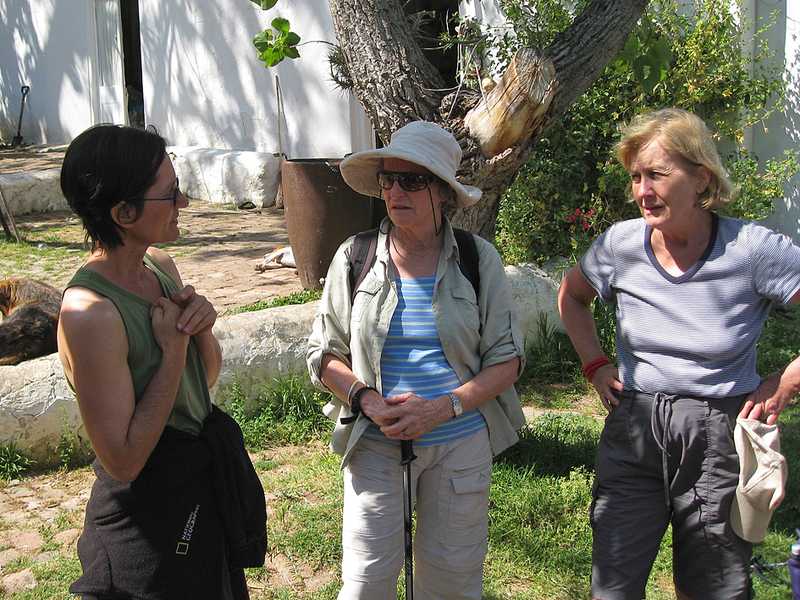 We were now in the heartland of Afrikaans language and Jeanette and Katrin regaled us with stories of the first Du Toits who settled in the area in 1792. 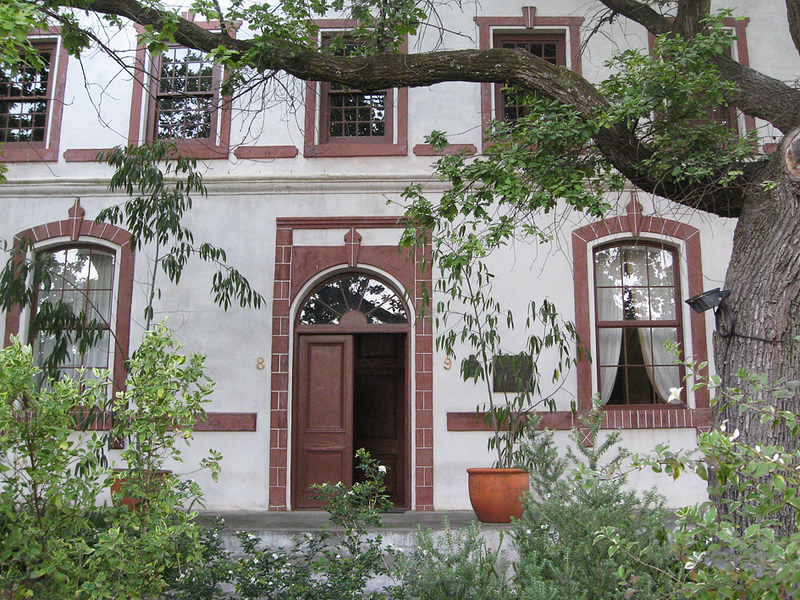 We actually had rooms in the first Afrikaans school in the country, the Hugenot Gedenkschool built in 1833 and restored in its original form in 2001. Today the farm is a guava producer and it was fascinating to see the meticulously pruned guava trees through which we walked. We had covered a distance of around 12 kilometres and although the going was relaxed and easy, we enjoyed a cooling swim, followed by a very pleasant dinner in one of the historic buildings on the farm. 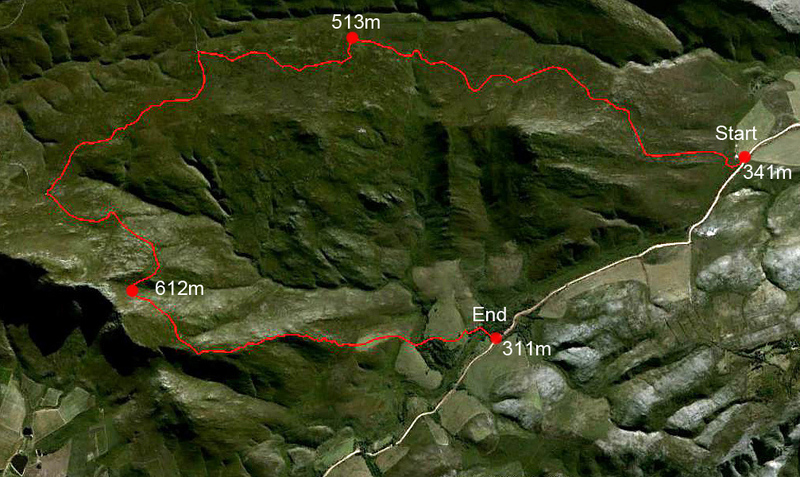 Tuesday’s task was to cover 16 kms to Val du Charron in the Krom River valley. Our guides were Jeanette and Carol (Katrin had a day with her horses). It was also a day dominated by three enterprising ladies. 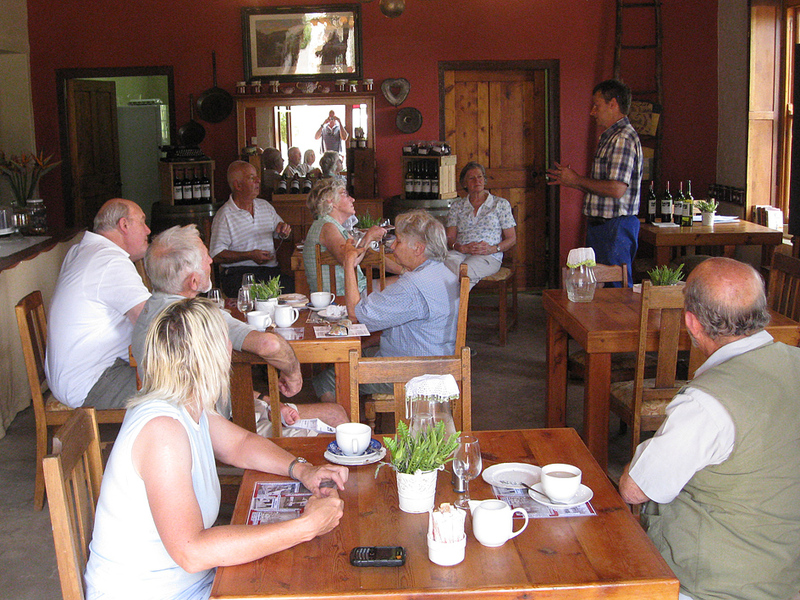 Our first stop was at Bloublommetjieskloof, a biodynamic farm, owned and operated by Wendy Lilje. Here strict biodynamic farming principles are followed and Wendy explained these whilst we enjoyed a welcome coffee break. The farm demonstrated a holistic approach to living, where the people, animals and plants exist together as a sustainable whole. 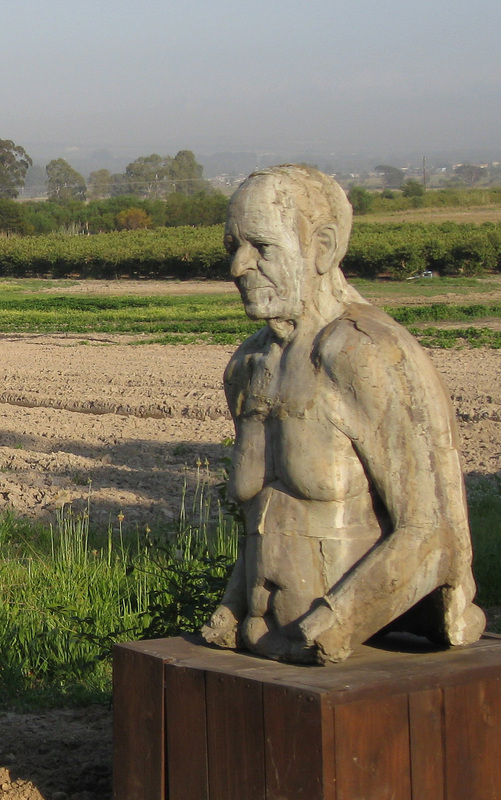 It is one of only two properties in South Africa which has managed to achieve Biodynamic accreditation and is therefore subject to rigorous annual inspections by the European parent body. 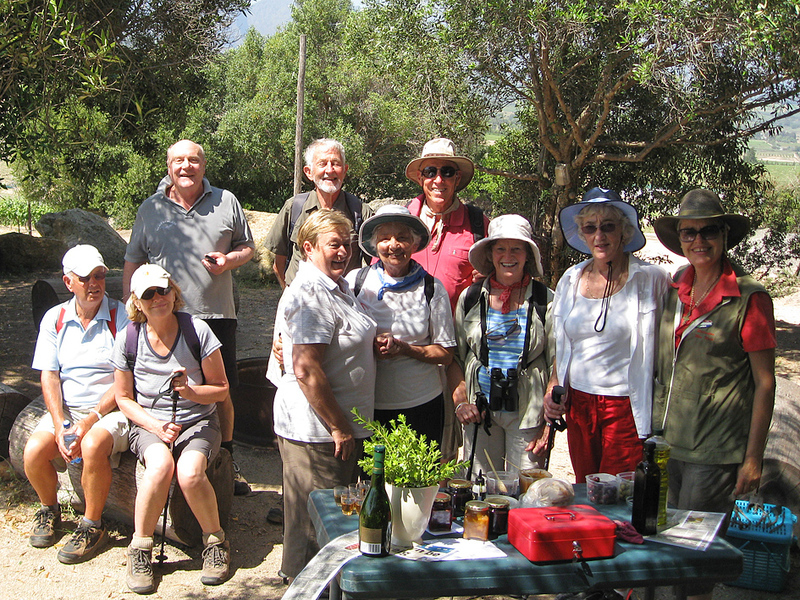 A pleasant walk through forests and vineyards brought us to a picnic spot on a hilltop, where we met Elsabé Du Plessis, a dynamic lady who talked to us about “stokkies” (grafted vine shoots) buchu, olives and jam. What a wonderfully entertaining lady she was, with a wealth of information and a great sense of humour. We were especially fascinated to learn about buchu and it uses. 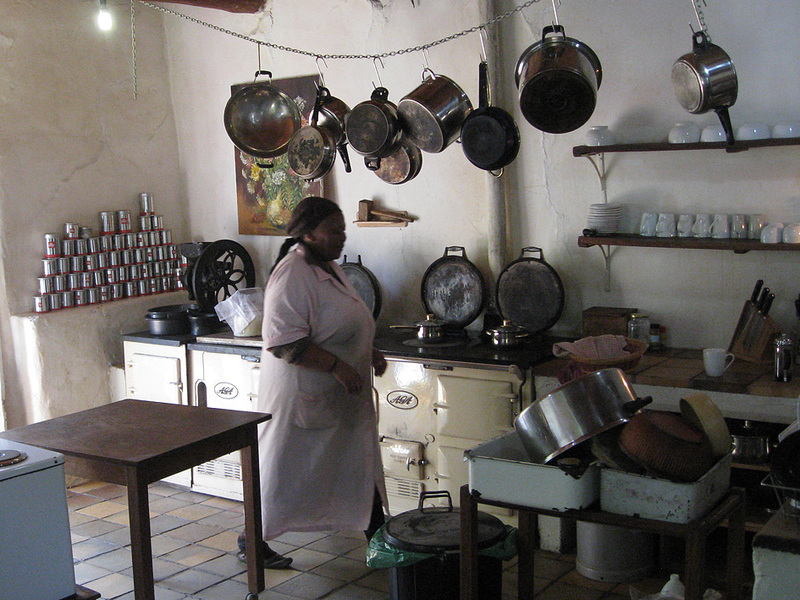 The farm, Uitkyk, is one of the biggest buchu pruducers and we even had a shot of her buchu brandy to ward off any ills. We then proceeded to Hildenbrand Wine and Olive Estate where we were entertained by the doyenne of South African olive production, Reni Hildenbrand. She showed us a fine selection of her wines and spoke at length about them and olive oil, whilst we enjoyed a light lunch and some fine cheeses. She provides a home for stray and abandoned animals and names a wine after one or two of them each year. We were lucky to sample Bonnie and Claire, a Chenin-Semillon blend named after her Bouvier twins. 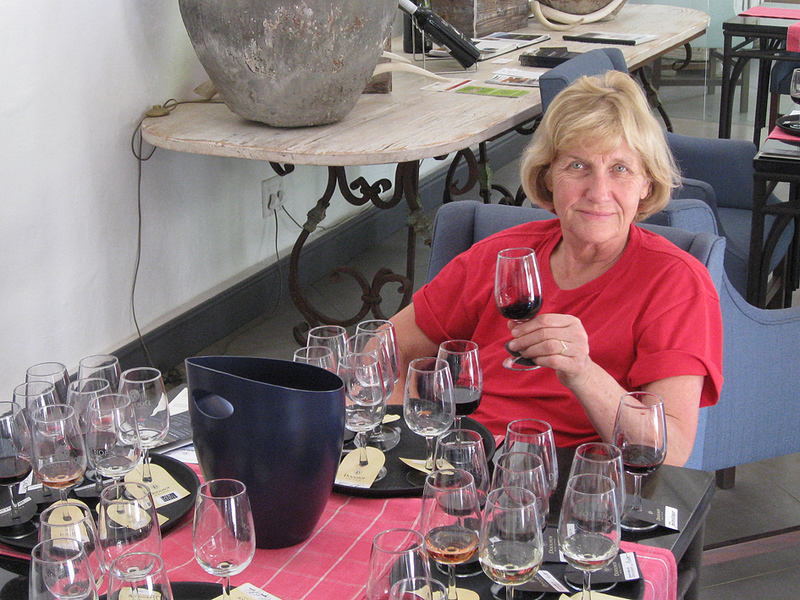 Reni is passionate about her wines and believes in doing things in the traditional way. A string of awards bears testimony to the quality of her products. 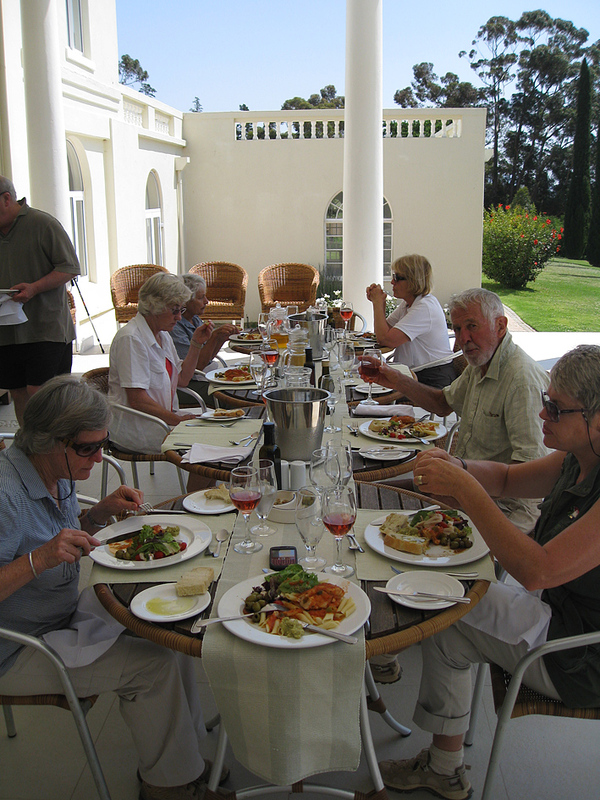 We arrived somewhat wearily at our destination for the night, the Val du Charron Wine and Olive Estate. Once again the pool was the first stop, after which we had dinner and were happy to fall into bed fairly early, but not before we had enjoyed the wonderful views over the Krom River Valley to the Hawekwa mountains beyond. As if on command the full moon appeared on the horizon. The farm has been extensively renovated by its new owners, Stuart and Catherine Entwistle, who appear to have spared no cost in trying to create a guesthouse with what must be one of the best views in the area. A cellar tour with Catherine, who is studying to become a wine maker, revealed some unusual technology, such as flexi-tanks made of plastic and French Acacia maturation barrels. It was quite an eye-opener! On Wednesday morning we were met by our guides, Ron and Carol (Jeanette was having her day off) and driven a short way up the famous Bain’s Kloof pass. From there we walked downhill into a beautiful secluded part of the Krom River valley where we found the hidden farm, Doolhof. A flight of excellent wines was presented for our tasting, culminating with The Minotaur, a Cape blend, which I really liked. The farm which is owned by Dennis Kerrison, has been extensively renovated and boasts a labyrinth (the word doolhof is Afrikaans for labyrinth and the name derives from the local topography). We then wandered down a leafy road alongside the Krom until we arrived at Welvanpas, the historic farm that has been home to the Retief family for 305 years. The present owner, Dan Refief, talked to us about the history, whilst we enjoyed a pleasant lunch accompanied by a tasting of his wines in the old mill house. His comments were interspersed with many anecdotes, and the family history, which has been meticulously recorded by his aunt, is obviously something of a passion. The farm was the birth place of the famous leader of the Great Trek, Piet Retief, who set out in 1837 in search of greener pastures. conducted us through the cellar, showing how the old and new have been successfully blended to form an impressive facility producing excellent wines. We were invited to taste a number of these which are made by Corlea Fourie and were bowled over by their quality. Amongst these was a Rosé made from 33 varietals grown in the Hemel-en-Aarde Valley at Hermanus. Besides being a wine producer, Bosman is also the largest vine nursery operation in SA, producing some 7 million grafted new vines per year from its ca. 1000 hectares of farms. 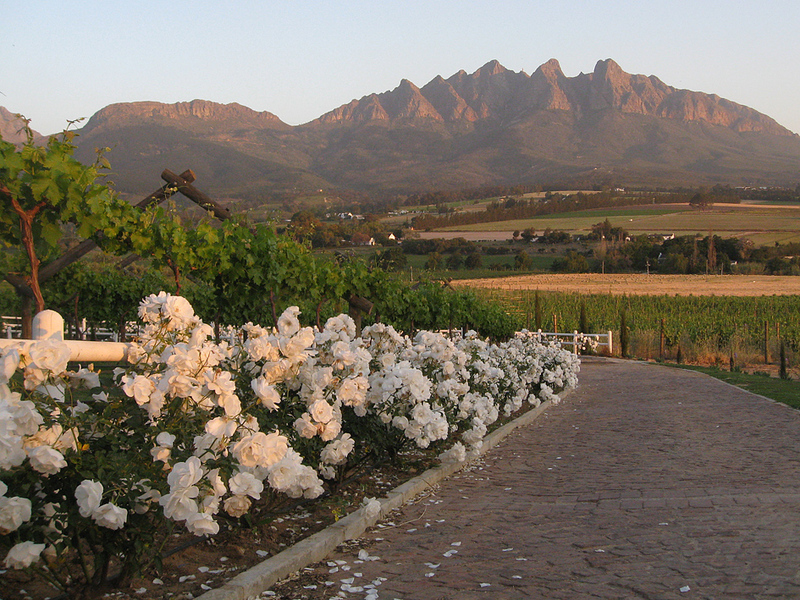 A final night spent at Val du Charron brought our wine walk to an end. Ian treated us to a very good Bosman Pinotage at dinner time. We all agreed that the whole outing had been a great success and we can recommend this tour to anyone who is moderately fit and wants to spend a few days really getting to know a very beautiful part of our country. 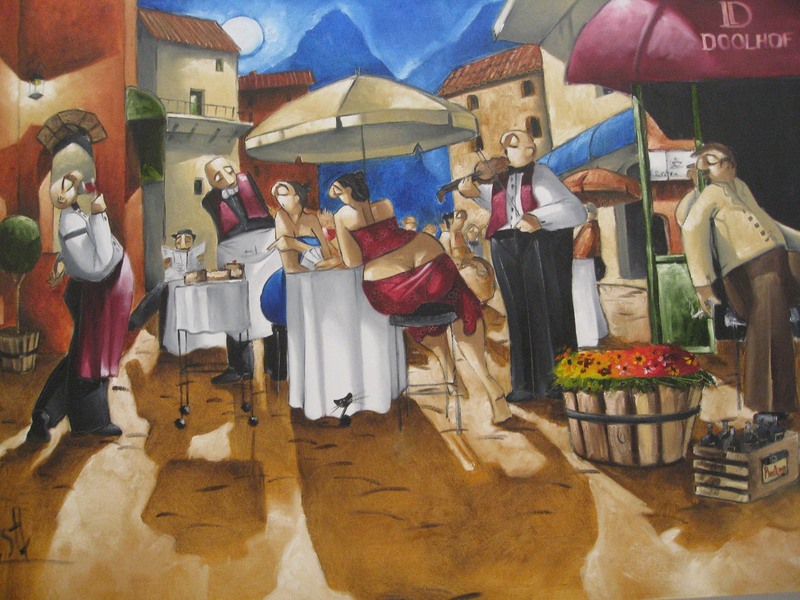 As I said earlier, it is more than just a wine walk – it is an experience in culture and history. All our guides performed excellently and were always on hand with answers to all our questions. 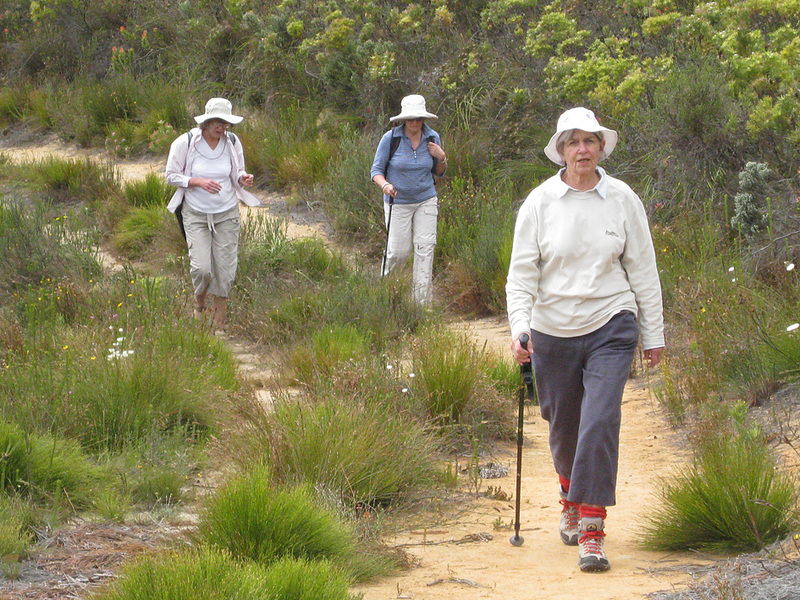 The walking took us along a variety of paths and tracks and we had ample opportunity to enjoy the forests and fynbos, as well as the vineyards and orchards. A total of 38 kilometres was covered on foot. Where there was a bit of a gradient, it was never too strenuous and there were many stops along the route to gather one’s breath and take in some water. Our cars were well stocked with a variety of local products for the journey home, and we all felt ready to add more oil and buchu to our diets, however, no further encouragement to drink more wine was needed!